Oh goodness this is darling! I love this sweet image and your wonderful coloring! The embossed hearts as your background are perfect on this! Such a sweet card! I love the embossed hearts. I will be right back...I am off to get this image! I LOVE THESE GUYS! This is SO ADORABLE, Denise! Love the white with the pops of red!! Denise...this is such a perfect Vanlentines card.I really like how you did the background with all the hearts! You colour soooo beautifully! P.S. I could not find that image.I went thru the site but no luck.I am going to look again as I just love that image! Great image for hubby's Valentine's card! Oh this is too cute! That image is darling. Is that an embossing folder? Never seen that one before. This is just precious! What a gorgeous card Denise,I love the image. Too sweet!! I just love all those red gemstones! Sooooo sweet, Denise! Your coloring is fabulous as always!! Oh my gosh! How stinkin' cute!!! Love the embossed background too! Ah this is so sweet, adorable image. So soft and sweet! Just "love" THIS! This card is gorgeous Denise! I love red and white for valentines/romantic cards, very traditional. I wish we could get that PB paper in the UK. Is your card size 5.5" x 4.25"? Thanks for also posting the copic colours, I've been looking for some ideas on colours for the mice! Oh my, this is super cute!! Love the white and red with it, totally rocks girl! So stinkin' cute! LOVE that embossed background! Denise this is adorable girl.. Love the embossing and love the colors. just ADORABLE!!!!!! 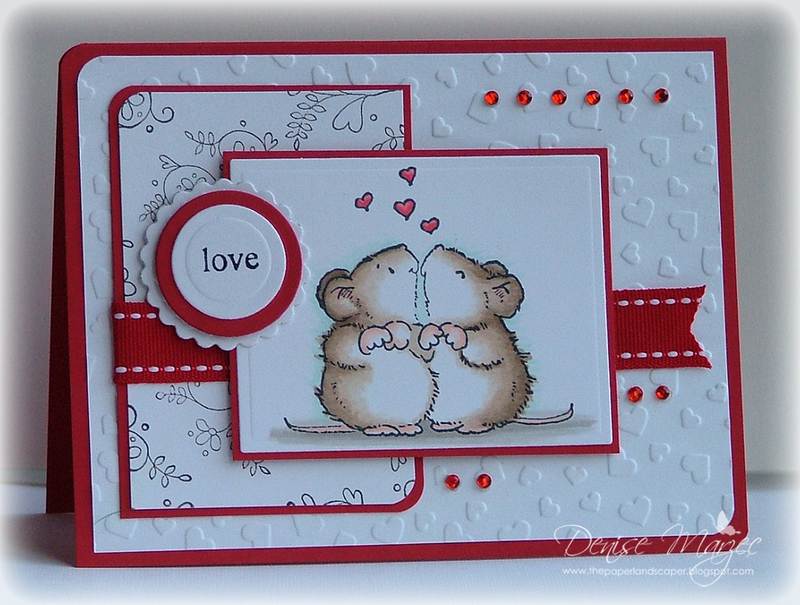 love this cute stamp and your beautiful card. Awww, you always use the cutest stamps, Denise!!!! This is such an adorable Valentine...love the great layout and all the bling, too!!!! Hope you and your family have a fabulous Christmas!!!! Oh this is just the cutest thing ever... .love the layout and your little guys.